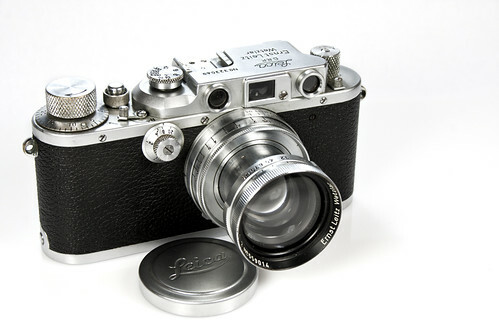 The Leica IIIb by Leitz is an upgrade of the Leica IIIa. It mainly differs by the position of the viewfinder and rangefinder eyepiece, which are separated by a few millimetres on the IIIa and are closer together on the IIIb. 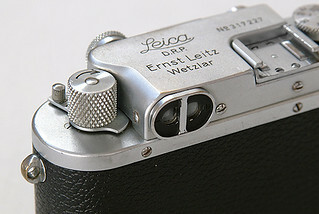 It was the first Leica to have the combined viewfinder/rangefinder eyepiece. The diopter correction lever for the rangefinder was moved to a different location under the rewind knob. The IIIb was made from 1938 to 1941 and some have military engravings. Serial number range 240,001 to 368,563. All were chrome finish except for five black paint made to special order in 1940. ↑ P-H van Hasbroeck, The Leica, (Sotheby 1983; ISBN 0-85667-171-1) Page 82. This page was last edited on 9 January 2017, at 21:08.